With hammer and nails. Tappity-tap. Until the 21st of May, you can see our papered menagerie in the window of the Port Jackson Press Gallery (in their brand new gallery space with pressed tin ceiling and copper plated doors). Louise’s delicate hand-coloured Red-Knots (Calidris canutus), Grey-rumped Treeswifts (Hemiprocne longipennis), and Superb Fruit-Doves (Ptilinopus superbus) neighbour a loose grid of my Dear You tales. And nestled at the heart of this formation, our last three prints made before our printer’s retirement late last year. Installed today, though already it feels an age ago, our animals holding their position by day and by night. Ready to do it all again tomorrow. Follow and see on instagram. Thinking of lowering anchor in Johannesburg. The disused Catholic Club is just about the right size. It’s not as ornate as I’d have liked, but it fits my proportions and my needs. In a quiet pocket of town, it sits, a great and empty block until I came along. Each day, I clean the muck from the windows with my bill. I’ll have this building restored to a little of its former glory in no time at all. I’ve the second floor shutters still to repair, and the goods lift no longer works, but it is for the next little spell a place I can freely hang my perch and settle down to my tasks. The building’s positioning also means I can hide around corners and then spring out, catching people unawares. Few in town have ever, it transpires, seen a giant Grey Parrot (Psittacus erihacus) spring. + Thank-you Louise.The full stop from the zine A Postcard as Measuring Device, which is available through our online store for $8.00 (AUD). In Durban once more, but this time is not like the last. Much of it has changed. Some parts for the better, and some parts for the worse. All as one would expect, a little good and a little bad, held in perfect though varied balance. It reminds me of the man I saw walking down the pier, balanced like the scales of justice. In one hand a small plastic bag of onions and in the other a larger plastic bag of bread rolls. All balanced, the left and the right, all keeping the equilibrium in check. What every warm day needs, a giant performing a belly flop and drenching those nearby; a dog absconding with a small child’s ice-cream, leaving but the cone; a little humorous shadow to cast on the light. A counterbalance to ensure stability. This is what ensures we neither float off untethered nor fall down low. The art of play is not so fine. It is quite simple, really. And good for the soul, it surely is. From my claimed seat in the gardens, a camel crossed my path and momentarily made for itself a wigged pink hairpiece from the foliage behind. Part floral crown, part neon halo, the impression drew delight down deep to tickle my very once-cynical bones. Such passing visuals make me chortle to myself. A camel can become a crowned head of state, unbeknownst to itself, and a lion can sport a fantastical mane of geraniums and zinnias and other showy bright blooms. And there to my left, a mouse with a fantastical cape of flora sailing through the air! The longer I sit here, the more I see. Proof positive that much good comes from quietly meditating. Pondering over that which is before me and letting thoughts randomly form, I think I could sit all spring long in such a place. Salvation comes in many forms and I believe I have found mine in the form of library’s quiet sanctuary and books and their knowledge they hold within. Squeezing in at first was hard, but I’ve found a place where I can hide by day and thus explore by night to free delight. Beneath the floorboards of Biology, I wait in curled up form. I wait for the library to empty of its librarians, students, time wasters, and the plain curious. I wait quietly, dozing in and out of consciousness. Come evening, I roam, I tumble, I roll, and I read. I even amend the texts of a few books in my field of particular knowledge. The dietary requirements of my kind are oft listed incorrectly. So, too, our social graces, or apparent lack thereof. So I ‘correct’ and retell history and her facts where rodents are concerned, and this, my good friend, this keeps me very busy indeed. Malicious streak awoken, I waited for them there on the rocks. I know, I thought, I’ll leave them. I won’t help them, no matter how much they cry and beg and simper. But of course, I did in the end. I’ve not grown that hard on bitter bones. I relented. I softened. I rolled over and let them rub my pinky belly. And so the experiment continues. I thought I could leave, but my subjects prove of great interest to me still. They adopt all manner of funny laws and peculiar ways. They picnic outdoors with good silver, the very picture of relaxed luxury — which I could get used to. And they taunt and tease each other until they cry — which I cannot get used to. I may have a thick pelt, but not a thick skin, as the expression goes, and am reduced often to tears behind the shrubbery. ‘Just a joke, just a joke,’ they coo. ‘Don’t take it so seriously, it was only a bit of fun,’ they tell me as they glue my tail back on to my rump. Heading soon to somewhere better for the soul, just as soon as I finish the last of the jam drops. Ruled by my stomach, kept small by their barbs, but still in awe of a great many of their ways, pulling myself free will be like pulling paw off exposed cabling. A Postcard as Measuring Device is a new zine of Dear You postcard collages, including the somewhat forlorn correspondence above, that promises to take you from Blackpool penguin-side to Berlin Glide by way of a little smooth flight imagining. This recent zine features a striped spine and was bound all perfectly square with bone folder, ruler, and acid-free glue by Louise over the weekend. It will soon be available through our online store, and, of course, you can pick up a copy at the launch of A Year of Southern Hemisphere Birds and A Flight of Twelve Southern Hemisphere Birds this Wednesday the 23rd. The launch promises to be a fun and intimate affair in the library, replete with Jam Drops and Lemon Hearts. See you there, fans of the Kakapo (Strigops habroptilus) and friends of the Shaft-tailed Whydah (Vidua regia), see you there. Rather lost my head, it seems, to the bright lights of Blackpool. Neither the first nor the last to do so, I waddled about in the pier feeling myself a giant and over stimulated goose. Quite the transformation, that, for a majestic Emperor Penguin (Aptenodytes forsteri) on annual holiday. Once more, I am fascinated by the human animal and their light globe mania. Their power fixation knows no bounds. They’ve made it a god and master. The electric hum holds me tight. Must shake free and return to my senses…just as soon as I stop playing with the flick, click, clickity-click switches. + A Dear You postcard collage from a forthcoming zine, A Postcard as Measuring Device. Expect Grey Parrots too. Mr Breton sends spring wishes. Sometimes I take great delight in small moments of everyday rebellion. I like to walk out of public restrooms with my paws unwashed much to the horror of the mothers nearby who are in the process of showing their children how to clean their hands properly. I like to shake my fallen hairs onto the neat person sitting beside on the tram. And I like to cross the road on the red man to the obvious displeasure of dog owners and parents trying to teach their canines and children a little road safety awareness. Such things may be small but the pleasure I derive from going against the norm and not being ‘conventional’ and ‘acceptable’ and ‘proper’, the pleasure it is huge. So long as no harm comes, I am content with this. It is one of the great joys of spring. Since early in 2008, I have been writing a series of imagined travels postcard collages. An occasional series that has grown and today, I am happy to report, has a new home. Dear You is where you will find all of the correspondence sent. From the very first one, bearing the discovery that it "seems they were not, after all, pulling my leg when they said that in New Mexico I’d find a giant sahuaro cactus taller than me" to painting zebras and waiting in Oslo for the chance sighting of the scarred Risso's dolphin (Grampus griseus), I am looking forward to this project continuing for as long as it amuses me. And to coming up with curious ways to sign off. We've travelled with shadow close at heel, and discovered Switzerland to be somesort of idyll. We've been to Niagara Falls and Dover. To Ballarat's Botanic Gardens at dusk. Where next? Good question. A day committed to the retracing of steps. A day (nay, make that a day AND its comrade night) more capable of going in wrong direction I’ve not yet had misfortune of meeting. Today, tonight, all of it, one backward canter perfectly performed. Perfectly polished to such a gleam that I see my form everywhere reflected. Reflected on the ground. And on the feathers of the giant birds who haunt my every step. Wings browbeat. Redo. Retrace. Rework. Refit. Remodel. Relink. Repeat. Re-, re-, re-, up until I think I’ll snap if I don’t yield to the humor that comes from a day committed to the retracing of steps. + Something new soon coming! A new home (to run alongside this space here) specifically for my Dear You suite. The eternal verity: look the part and they’ll never know. Now that I am here at long last the very thing I’ve dreamt of at irregular intervals is not quite as I’d expected it to be. 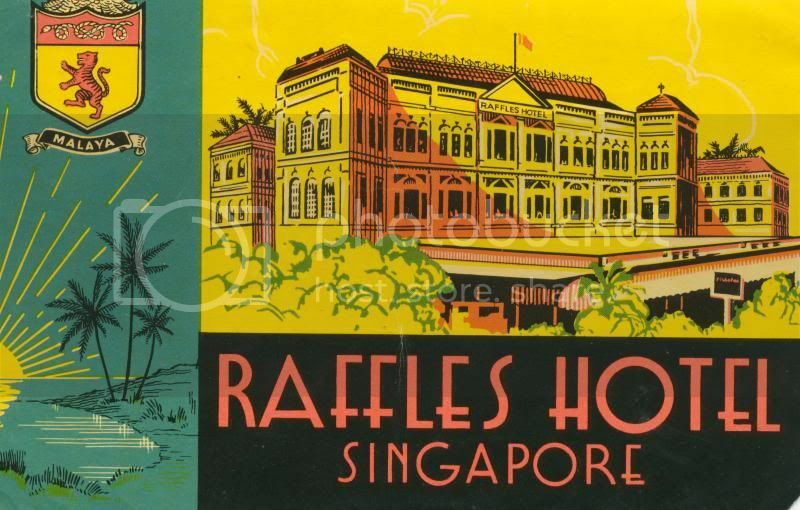 Raffles. Singapore. A Hotel. A destination. Long in my mind. Now an actuality. I am writing this to you from my shaded spot beneath the trees. Summer’s already browned lawn. Late haze of day. I’m soon headed for the hotel’s hair salon. To be quietly brought into follicular line with a focused snip, snip, snip. With a little fussing, I may, just may, be granted entry to the bar and ballroom. The eternal verity: look the part and they’ll never know. 1 a diagrammatic representation of an area of land or sea showing physical features, cities, roads, etc. : a street map. • a two-dimensional representation of the positions of stars or other astronomical objects. • a diagram or collection of postcard collages showing the spatial arrangement of works on a gallery wall: a map to make the installation process smooth. An obsession with right angles revealed. I am Poirot neatening the paper spills on the mantel (The Mysterious Affair at Styles). Quite my favourite part, the laying out of work made but not for longest time seen. From one small white box for transportation’s ease comes over 450 postcard collages. Within, all are wrapped in column bundles of seven horizontals or five verticals. Together, they make one long grid, and I am looking forward to installing this work once more (but with variation and addition) come August as part of an exhibition, All breathing in heaven. In a room where normally I do yoga, over recent long weekend I was able to lay out this work and make plans to add in 28 new postcard collages (which specifially tip their hat at Geelong) to the meld. The room alive with different Dogs, Cats, Cows, Eagles, and Camels, and the floor littered with paper order where normally there are purple mats. Having quiet play of such a space proved great for the head. Time to think as plans were drawn. (Time, as in below you'll see, to sit and post previews to instagram too.) And now our map is complete. + Upon related note, within this temporary makeshift box, twelve of Louise's exquisitely drawn Southern Hemisphere birds reside. For the month of April, a Yellow-fronted Woodpecker (Melanerpes flavifrons). For September, one Superb Fruit-Dove (Ptilinopus superbus). And finally, in this visual peep, November's bird, in ring of a kelp, an Antarctic Tern (Sterna vittate). + To those of you heading to Vanguard, The Australian Ballet's triple bill, triple thrill, this evening, I wish you a wonderful experience. It is a true celebration of the physical form and how it can move, convulse, be powerful, be languid, be pulled like marionette or swim in defiance of gravity. It still tugs at my heart. I'd love to hear your thoughts.